Romanian warfare can trace its early roots right to the powerful Dacian Kingdom that opposed the Roman Empire in the 1st century BC. In the medieval era, it was very much at the frontline against the rise of Islamism in Eastern Europe, and in the XVth century, the great principalities of Romania took shape, Moldova in the east, Transylvania in the west and Wallachia in the south. However, all three eventually came under Ottoman suzerainty from 1541 to 1711 or later, although with an autonomous status. In 1600, all three were shortly united by Wallachian prince Michael the Brave (Mihai Viteazul), which helped forge the Romanian national identity. Transylvania later passed under Austro-Hungarian sovereignty, and in 1821 nationalistic tensions led to an uprising, which started a larger movement for independence, echoed by the 1848 revolution in Moldova and Wallachia. The latter adopted the blue-yellow-red flag (although horizontal), which later transformed into the familiar flag we know today. The Romanian Army was officially created on 12 November 1859, following the unification of Moldova and Wallachia under Alexandru Cuza. He was deposed in 1866 and replaced by a Hohenzollern Prince, Carol I of Romania. Eventually, after active participation in the 1877-78 Russo-Turkish war, these two provinces gained full independence from the Ottoman Empire. Although neutral until 1916, Romania joined the Entente Powers under promises of territorial gains (the secret Treaty of Bucharest) but, after some initial successes, the army was repelled by a massive Central Powers’ advance, loosing almost two thirds of the territory before a stalemate began in 1917, which concluded with the decisive victories of Mărăşti and Mărăşeşti with the help of Russian forces. Total losses combined were estimated to 748,000 at the end of the war. But, according to the 1919 Treaty of Saint Germain, the victors granted Romania the promised territories, including Bucovina (from Austria) and, in 1920, ( Treaty of Trianon) Transylvania and Banat from Hungary, and eventually Bessarabia (treaty of Paris) from Russia. At that time, the country covered its maximal territorial extension and it was also a time of great reforms, industrial and economic growth under a democratic regime, and the set up of a modern professional army. 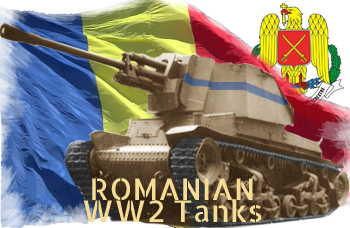 The creation of the First Armored Battalion in Romania took place in 1919, due to the Romanian-French collaboration. No less than seventy-six Renault FTs were obtained, of which 48 were males (armed with the 37 mm/1.46 in Puteaux gun) and 28 females (Hotchkiss 8 mm/0.31 in machine-gun). Seventeen were refurbished both at the newly created Leonida Works (Ateliere Leonida) and in the state’s Army Arsenal in Bucharest. In 1936, replacement came with a massive plan of tank acquisitions, aimed at creating a fully armored division, with the very light R1 (Skoda AH-IVR) for the cavalry and the medium-light R-2 (LT vz. 35) for the 1st Tank Regiment. In 1938, no less than 200 Renault R35s (earlier negotiated to be licence-produced locally) were also ordered, but deliveries were so slow than only 41 were received before the fall of France. However, 35 former Polish R35s, which took refuge in Moravia, were captured and integrated into the 2nd Tank Regiment of the 1st Armored Division in late 1939. Alongside these, a tankette was licence-produced, the Malaxa Tip UE, as a supply carrier, gun tractor and reconnaissance vehicle. The turbulent thirties were a consequence of the financial crisis back in USA, which spiraled into social unrest, high unemployment and strikes, years also marked by a political extreme instability and the rise of fascism, between the authoritarian tendencies of King Carol II and the nationalistic Iron Guard. This will culminate with the accession to power of Marshal Ion Victor Antonescu after the war broke up in September 1940, and full alignment with the Nazi regime. The 1st Romanian Armored Division, composed of two regiments, did not participate in Operation Barbarossa at first. However, these forces destroyed or captured entire Soviet divisions, making provisions of dozens of tanks and artillery pieces in the process. The front remained relatively static in June-July 1941, but was followed by Operation München (retaking Bessarabia and Northern Bucovina) in 1941, the Ukrainian campaign, and the thrust into Crimea with the 3rd Army. From July to October, the 4th Army undertook the siege and battle of Odessa, one of the costliest and bloodiest affairs of the whole campaign. The Crimean campaign itself would last until July 1942. The 6th Corps (Corneliu Dragalina) soldiered from Kharkov to Stalingrad. Meanwhile, the 3rd Army (subordinated to the German 17th Army) fought in the Caucasus, reaching as far as Grozny in October-November 1942. However, with the rout of the forces near Stalingrad, communication lines were threatened and a general retreat was ordered. While the 2nd Mountain Division joined Rostov, the 17th Army was assigned to the Taman peninsula. The campaign stretched from February until September 1943 in the Kuban. The remaining forces were trapped in Crimea until February 1944 (operation “Festung”) and made a last stand until May 1944, but most troops were successfully evacuated with the help of the Romanian Navy (“Operation 60,000”), including 36.557 Romanians (4,262 wounded) and 58,486 Germans (12,027 wounded). In the summer of 1942, the bulk of the Romanian armored forces were posted on the Don’s bend, covering the flanks of Paulus’ 6th army engaged in and around Stalingrad, along with other allies, Hungarians and Italians. At that time, however, the Romanian armored units had already suffered many losses (most occurred during the siege of Odessa), and the tanks in service then were no match for the T-34. The 1st Armored Division also operated in the Kuban, Crimea, Bessarabia and Caucasus. Losses were compensated by German deliveries of 26 Pz.Kpfw.35(t) in 1942, 50 Pz.Kpfw.38(t), 11 Pz.Kpfw.III Ausf.N and 142 Pz.Kpfw.IV Ausf.G after 1942 and 118 StuG IIIs in 1944. Alongside these, Ateliere Leonida delivered 34 TACAM T-60 and 12 TACAM R-2 tank hunters, while the very promising Mareşal tank hunter was developed. Production was cut short in August 1944, but it was to inspire the Czech-based German Hetzer in 1944, one of the best and more prolific tank hunters of the Axis. Romania also operated many captured Russian tanks, like the T-60 and a few T-34s, and operated armored cars as diverse as Skoda vz.25, vz.27, Tatra vz. 29, Autoblinda 41, BA-10 and BA-64. Called “AB”, ten Sd.Kfz.222 (1942) and some Sd.Kfz.223s were also delivered by Germany. However, the most current vehicle used by the Romanian Army on the Eastern front was the German “Famo” halftrack, of which 2322 were delivered from 1939 to 1944. After the near-annihilation of the 1st Armored Division in early 1943 and its retreat to Romania, the army was reorganized with the help of the German Army, with new tanks and the promising Mareşal, then scheduled for production in the summer of 1944. However, by March-April 1944 the Red Army resumed its offensive and Odessa fell, while the offensive crosses the Dniester. The rearguard (German and Romanian forces) retreated into Romania and took defensive lines between Răscăeți and Palanca, north of the XXIst division. The next offensive would prove critical, as Romania was invaded, the defenses crumbled, and in August an insurrection overthrew Marshal Antonescu and the fascist regime. A new provisional regime sympathetic to the USSR as established and, until the end of the war, Romanian Forces fought under control of the Red Army against German Armies to claim back its territory. After the war, Romania entered the Soviet sphere of influence and later joined the Warsaw pact. Romanian FT, as modernized by Ateliere Leonida in 1939. These vehicles were used to guard important industrial and urban centers throughout Romania. They would play a key role during the August 1944 coup d’état, especially during the ensuing fighting against the Germans. R1 (AH-IVR) tankette, of those bought in 1936. A contract was signed in August of that year for 36 machines from the Czech Skoda-CKD company. The new “light tanks”, were tailored for the Army’s needs. They had no commander cupola, lighter armor, 50 hp Praga engine, increased range and speed. They equipped the mechanized reconnaissance squadrons of the 1st, 5th, 6th, 7th, 8th and 9th Cavalry Brigades (with either 6 or 4 tanks each).They saw action with the cavalry corps in Ukraine and the Caucasus in 1941-42. No less than 126 Škoda LT vz.35s were also ordered in August 1942, in order to form the bulk of the active armored battalions with a much heavier tank than the R1 (although still light by 1940’s standards). The first delivered in 1937 were returned due to engine defects and other required modifications, and eventually delivered in 1939, while another order of 382 was later shipped to Germany instead. These R-2s represented the bulk of the 1st Tank Regiment of the Armored Division in 1941-42, and distinguished themselves at the battle for Kishinev, but suffered crippling losses in Odessa due to Soviet infantry AT rifles. Later, in August, the unit was replenished with 26 ex-German Panzerkampfwagen 35(t)s, and was defending the Don’s bend with the 3rd Army. They were caught by a massive counter-attack, where these tanks were found to be easy prey for the T-34. In total, the unit retreated from Ukraine with more than 60% losses. The survivors were seen in action again in 1942 in Bessarabia with the Cantemir Mixed Armored Group and Popescu Armored Detachment defending Ploiești. In December 1937, another contract was signed with Renault in France, for the delivery of Renault R35s. However, plagued by strikes, the company could not deliver more than 41, the factory being stretched to full capacity by other deliveries, exports or for the French Army. However, to those delivered were added the 34 R35s of the Polish 305th Battalion, interned after the end of the Polish invasion. Altogether, they formed the 2nd Tank Regiment. Local modifications include a 7.92 mm (0.31 in) ZB machine gun, steel-rimmed roadwheels and reinforced suspension. They were used only for infantry support (whereas the R-2 was seen as more versatile), stationed in Bessarabia and Northern Bucovina. But they were also in action at the siege of Odessa and later stationed in Transnistria. In 1944, 30 of these were modified at Ateliere Leonida with Russian 45 mm (1.77 in) guns. The Vânătorul de Care R35 was an improvised “tank hunter” built by rearming an R35 with a well-modified captured Russian 45 mm (1.77 in) gun in 1944 at the Ateliere Leonida. The guns were reconditioned and modified at the army arsenal in Târgoviște to accept new shorter gun breeches, cast at the Concordia factory of Ploiești. They were of much better military value due to their good armor and excellent gun, but still plagued by their low speed. They equipped the 2nd Tank Regiment and later the Popescu Armored Detachment at Ploiești in August. Further conversions were planned, but never took place. The T-38 was the local designation for the wartime deliveries of Panzer 38(t)s from the German army in 1943, intended to replenish Romanian losses, and 50 were obtained in May-June. They served with the forces operating in Kuban. These formed the T-38 Tank Battalion, organic to the 2nd Tank Regiment and later the 54th Company attached to the HQ and, eventually, the cavalry corps, soldiering in Kuban and Crimea. Back in Romania, they were still in action with the 10th Infantry Division in 1944. In October 1942, the German Army was aware of the lack of suitable tanks, both in numbers and quality, in Romanian service and decided to send 22 medium Panzers to their ally, including 11 Panzer III Ausf.Ns, the latest in use, armed with a low-velocity 75 mm (2.95 in) gun. These formed the 1st Tank Regiment deployed on the Don’s bend, while some formed the 2nd Tank Regiment left in Romania for training. The Soviet counter offensive at Stalingrad destroyed all but one of the T-3s stationed on the front. In early 1944, surviving T-3s were part of the Cantemir Armored Group. 11 Panzer IVs were delivered at the same time as the Panzer III Ausf.Ns, in October 1942, joining the 1st Company of the Tank Regiment, 1st Armored Division, operating in Kuban. These were of the Ausf.G type, up-armored and armed with the KwK 75 mm (2.95 in) long barrel gun. Another one was sent in Romania for training and security with the 2nd Tank Regiment. No less than ten were lost in the battle of the Don’s bend. However, in early 1943, the MIAPR (Romanian Ministry of Army Endowment and War Production) ordered 150 T-3s, T-4s and 56 StuGs and, by August 1944, 110 T-4s of the F, G, H and J types were received.In February 1944, 30 were part of the Cantemir composite group, and 32 of a fast Armored Detachment, all stationed on the Moldavian front, while the remainder 48 formed the bulk of the 1st Regiment. Until August, this unit suffered heavy losses and, after its retreat, was captured by the Soviet Army (peace was signed in the meantime). Some fought under Soviet supervision against the Germans, in the Armored Detachment of Lieutenant-colonel Matei until September, and after under Romanian command. Others took part in the fights to retake Bucharest under General Niculescu’s command (General Rozin corps), while others served with the Popescu detachment around Ploiești. Starting in November 1943 and until August 1944, the Germans delivered 108 StuG III Ausf.Gs, to be used by the 1st Tank Regiment, the 8th Motorised Cavalry Division and the 4th Army Detachment, and later by the Mechanized Training Center in Târgoviște. In Romanian service, they were called TAs (Tun de Asalt). Most saw action in the battle of Moldavia and the Iassy-Khisinev pocket operation, but others were captured by German Forces (Braun Armored Detachment) and most survivors were later captured by the Soviets in August 1944. Eventually, some were part of the 2nd Tank Regiment engaged against the Germans to claim back Transylvania and in operations in Czechoslovakia in late 1944-early 1945. TACAM T-60: Although Marshal Antonescu ordered the development of a tank with similar abilities to the T-34, the Ateliere Leonida managed to create an efficient tank hunter, marrying some of the 175 captured T-60 light tanks and 32 F22 76 mm (3 in) guns stockpiled in abundance in 1941-42, protected by salvaged ex-BT-2 armor and propelled by GAZ 202 engines. The result was somewhat inspired by the Marder, but of lower profile, and faster. TACAM R-2: These tank hunters were developed on the chassis of obsolete R-2 (LT vz.35) in 1944. They were developed at the same time and location as the TACAM T-60s, under Lieutenant-Colonel Constantin Ghiulai’s supervision. Twenty were heavily modified and armed with captured 76.2 mm ZiS-3 artillery pieces, which had enough muzzle velocity to be effective against armor even in June 1944. An alleged inspiration source for the German Hetzer tank hunter, the Mareșal was designed in order to develop a local tank hunter with available resources. The technical team in charge of the project was composed of Major Nicolae Anghel and Captain Gheorghe Sambotin with the help of engineer and Lt Colonel Constantin Ghiulai. Initial tests included a 122 mm (4.8 in) Putilov-Obuhov howitzer mounted over the T-60 chassis, protected by an extremely sloped armored casemate. While its thickness was only 20-30 mm (0.79-1.18 in), still light, the angle raised its effective thickness against direct fire, making it virtually impenetrable to the 76 mm (3 in) gun of the T-34. Trials were performed in July 1943, revealing numerous problems, and three other prototypes were built and tested until October 1943. The new tank was named in honor of the leader of the country, Marshal Ion Antonescu. New tests occurred in the Sudiți with a Romanian AT gun, the 75 mm DT-UDR No.26 and under proposition of Colonel Paul Draghiescu, it was adopted for production. In November, 1000 Hotchkiss engines were ordered in France. However, the M04 interested the Germans and it was presented to Hitler by Marshal Antonescu in December. The 5th prototype underwent tests and modifications helped by Alkett and Vomag specialists in March-May 1944. The H39 engine and gearbox were French, the tracks were Czech and the optics and radio were German. 1000 were ordered in May 1944 by the high command, however, due to Allied bombings, the first series was delayed until November 1944 and a bi-national joint production program with the Hetzer was setup. Other tests were performed until August 1944, when the armistice led to the cancellation of the project and everything was later confiscated by the Soviets.